Cod Liver Oil for Acne – How Effective is it? Are you looking for some natural remedies for curing acne? Majority of us suffer from acne breakouts, which can be really embarrassing when we go out on parties and get-togethers. Cod liver oil is an effective natural remedy for acne. Acne affects nearly everyone. Rather than casing any serious health conditions, acne cause a lot of annoyance and inconvenience. You can see people from all walks of life suffering from acne. It can affect all skin types. Mostly it appears during the growing stage and the adolescent stage. However, it can also appear in adults. Acne is a not a serious condition and it does not harm the skin. But it can affect the way you look and therefore your confidence levels. There are many treatment options for getting rid of acne. Production of excess sebum by the body. Dead skin cells on the surface of the skin clogging the pores. Contamination of the skin by bacteria. Acne may occur in various forms, like blackheads, cystic acne and pimples. Cystic acne is very painful. It takes some time for all forms of acne to subside. Take care not to scratch them, as this can result in a scar on your skin. Although acne usually appears on your face and the neck, it may also be found on other parts of the body. Why to go for Natural Acne Treatment Methods? Most of the people want to get quick relief from acne and this makes them rush to the chemist shops and buy products to get rid of acne. These readymade acne solutions come in the form of gel, cream or ointment and may contain chemicals that can be harsh on the skin and damage the skin. Some people may get quick relief from acne by applying these, but all may not be lucky enough. If you have sensitive skin, you may get aggravated acne or skin drying after using these solutions. So, it will be better if you use natural remedies to cure acne, like the cod liver oil. How Good is Cod Liver Oil for Acne? 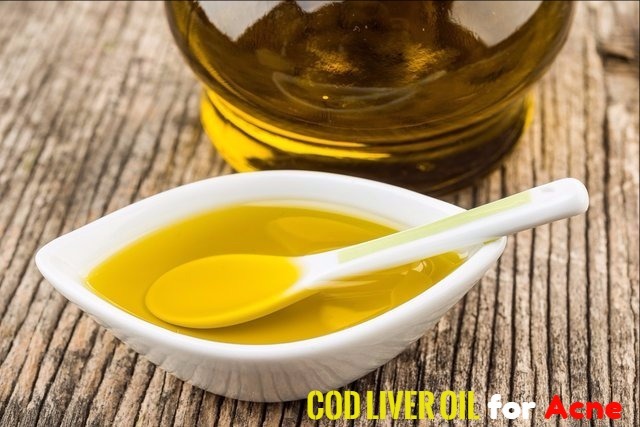 Cod liver oil is made from the liver of cod fish. It is rich in various nutrients that are good for the health of human beings. Most people take cod liver oil internally in the form of capsules. The ingredients present in cod liver oil make it great for fighting against acne and getting rid of it. Vitamin A is found in high amounts in cod liver oil. This vitamin contains retinoic acid, which helps in improving the cell health. Vitamin A is very beneficial for cell renewal. It enables new skin cells to form and replace the damaged skin cells. It also helps in getting rid of acne scars and spots form the skin. The size of the sebaceous gland is reduced with the help of Vitamin A. when the production of sebum is reduced acne breakout is also controlled to some extent. Vitamin A in cod liver oil is more effective than the synthetic vitamin supplements. Cod liver oil also contains Vitamin D in fair amounts. This vitamin has anti-comedogenic benefits as well as antioxidant properties. This way it is useful for treating acne. Studies have shown that Vitamin D can signal sebaceous glands and reduce the production of sebum. Cod liver oil contains omega-3 fatty acids. These are healthy fatty acids and help in controlling inflammation of the skin. So, cod liver oil is very effective for treating cystic acne. Since omega-3 fatty acids have anti-inflammatory properties, you will not suffer from any side effects. By using cod liver oil you can treat acne as well as get rid of the acne scars from the skin. Most acne tends to leave blackish scar marks on the skin. Scratching also leaves marks that take time to fade. Cod liver oil contains vitamin A, which can promote skin cell regeneration. So, you can see that the acne scars fade faster than usual by applying cod liver oil. It will not give you instant results. You will have to use it regularly and you will see the difference within a month or so. All the brands of cod liver oil may not be suitable for treating acne. Broadly there are two types of cod liver oil – refined and fermented. Refined may not contain all the nutrients in it. So, often synthetic vitamins are added to it. Fermented cod liver oil is one in which cod fish is fermented with some sea water for several months. This is in its natural form and retains most of its benefits. It costs relatively more than refined cod liver oil. Intake of some cod liver oil variant can cause side effects like headaches, stomach upset and bad breath. Usually it takes place when you use refined variety of this oil. So, try to use fermented variety of cod liver oil. Make sure that you take it in the right dosage. Vitamin A in this oil can react with some medicines. So, if you are on medications for diabetes, high blood pressure or kidney disorders, you should consult your doctor before you start having cod liver oil. Make sure that you do not consume this oil in excess, as Vitamin A in it is high. Excess vitamin A can cause health problems. In some people acne symptoms get worse after taking cod liver oil. This oil has the ability to absorb mercury like any other sea fish. So, if the manufacturers do not take care to purify the toxins during the process of manufacturing the oil, it can harm you. Make sure that you are buying one that is not contaminated. Read the labels carefully so as to be on the safer side.